Enjoy the rarity, appearance, and durability of our quartzite kitchen countertops. 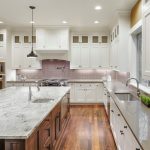 If you are renovating your kitchen and need new countertops for your Westerville, Ohio home, you may be wondering about the difference between engineered and natural countertops. There are advantages to both types. When it comes to natural materials, granite and marble are what usually come to mind, but here at The Granite Guy, we are proud to offer quartzite kitchen countertops, which are a favorite for those who are looking for a rare and exotic option. Quartzite kitchen countertops are generally found in white shades resembling marble. If you love the look of marble but desire something more durable and harder, quartzite is a great choice. Quartzite is created when sandstone is subjected to extreme pressure and heat due to tectonic plate compression, so it is considered rare because this process hasn’t occurred nearly as often as the processes to create other natural stone materials. In addition to its inherent beauty, you’ll want to consider quartzite kitchen countertops if you desire countertops that are harder than granite and can withstand heat. Typically, quartzite needs to be resealed once or twice a year to avoid staining, but we offer an effective 15-year sealer that makes quartzite a low-maintenance option for your renovation. With its hardness and beauty, quartzite is a material that will give you many years of performance and enjoyment. If you would like to know more about quartzite, we would be happy to further discuss its advantages. Contact us today with any questions you may have about our quartzite kitchen countertops or stop by our showroom to discuss your upcoming project.